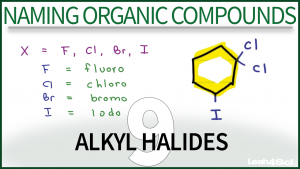 The Naming Alkyl Halides tutorial video takes you through my puzzle piece approach to IUPAC Nomenclature for compounds containing the halogens F, Cl, Br and I. Examples include simple and substituted alkyl halides, along with halogenated alkenes and cyclic compounds. This is Video 9 in the Naming Organic Compounds Video Series. Click HERE for the entire series. Leah; thank you very much. Your way of explaining is great. Thank you very much. Flor from Mexico City. what if instead of i iodine there were 2 4m where should we start ? I’m not sure I understand your question… At which point in the video does this come up? I noticed that you do not keep the 1 (4:44), BUT in some of the alkane and alkyne examples, the 1 is kept. ie 1-fluorocyclohexane and 2-methyl-1-pentane. The 1 is removed for the first example, but the latter keeps the 1. Could you further explain the difference?